Wind and solar will claim cost leadership in Europe, according to a new study. A new study suggests that wind and solar plants are already competing economically with fossil fuel in Europe. Soon, even household rooftop solar PV systems will generate electricity more cheaply than coal. 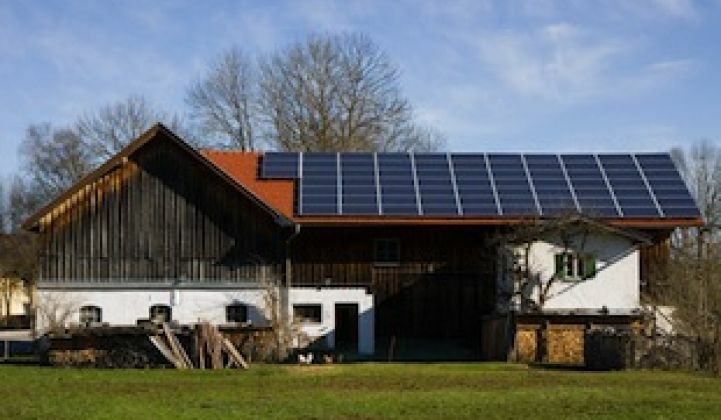 The study from Germany’s Fraunhofer Institute for Solar Energy Systems says the cost of rooftop solar in the southern parts of Germany is already as cheap as €0.08 per kilowatt-hour. Even in northern Germany, where there is little sun, solar can be generated at €0.14 kilowatt-hour, half the cost of grid-based electricity. By 2030, the study says, the levelized cost of energy (LCOE) from rooftop solar PV will have fallen to around €0.06 per kilowatt-hour. In sunnier regions, such as Australia, the Middle East, southern Europe and the western U.S., not to mention Africa and Latin America, the cost of solar will be lower still, at around €0.043 per kilowatt-hour. The study claims onshore wind in Germany is already between €0.05 per kilowatt-hour and €0.11 per kilowatt-hour, a figure that is unlikely to fall further. Fuel costs for fossil fuel plants, however, are likely to rise. 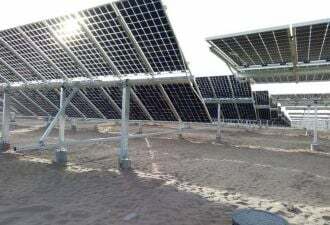 “Even small, roof-installed PV systems will be able to compete with onshore wind, and also with the higher generation costs in the future from brown coal, hard coal and combined-cycle gas power plants,” Fraunhofer ISE Director Eicke Weber said in the report. He says it is clear that wind and solar will “win the race toward cost leadership” with coal and gas. Although offshore wind has higher costs, it also has more hours at full load operation. The higher costs for biomass systems are balanced by their controllability. The implications of this are obvious. Having households that are able to produce electricity at the same cost of coal -- not including the network, distribution, and retail costs that are added to centralized generation -- is likely to dramatically change the business metrics of the utilities industry. 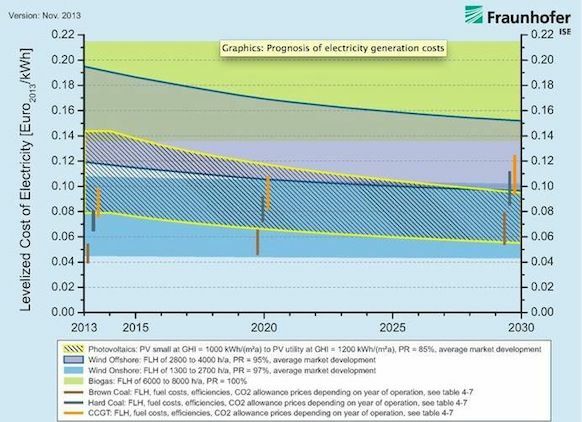 Fraunhofer says the availability of wind and sunshine is not the only variable in the costs of energy. Financing costs and risk premiums for new power plants can also affect the results substantially. “Only by including these factors in our study are we able to realistically compare the levelized cost of electricity from the different technologies and thus convincingly present the cost-competitiveness of renewables." That means that project risk and financing costs may cause solar projects in African countries, for instance, to cost more than elsewhere. The U.S. and Australia, however, will be able to combine excellent solar resources and low financing costs. The study said offshore wind technology still shows a large potential for cost reductions, whereas onshore wind has nearly reached its limit. Levelized electricity generation costs from biogas, widely deployed in Germany, is dependent on load and fuel type, and ranges from €0.14 to €0.22 per kilowatt-hour. Estimates for the cost of electricity from brown coal presently extends up to €0.053 per kilowatt-hour, from hard coal up to €0.08 per kilowatt-hour, and from combined-cycle gas power plants up to €0.098 per kilowatt-hour, respectively. In the Middle East, considered to be the next big market in solar, oil-fired power plants show generation costs in the range of €0.13 to €0.17 per kilowatt-hour, compared to PV with an LCOE of around €0.08 per kilowatt-hour. Editor's note: This article is reposted from RenewEconomy. Author credit goes to Giles Parkinson.